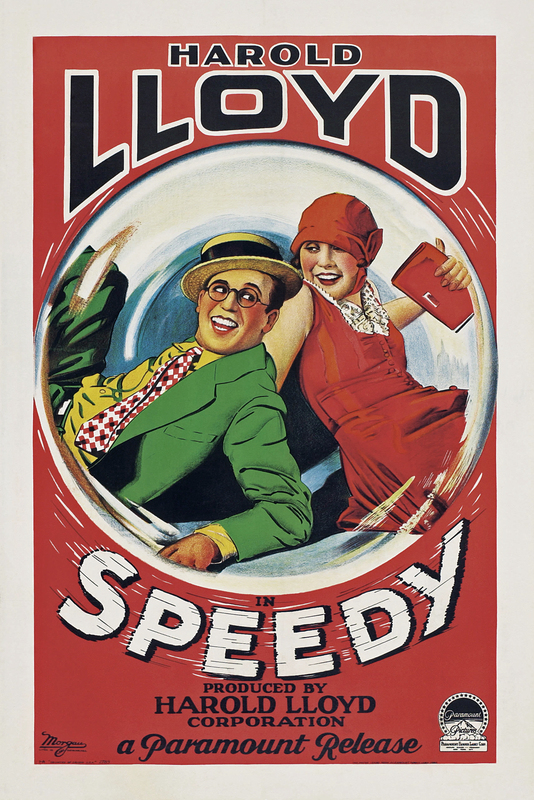 This Saturday morning, May 30, Harold Lloyd’s granddaughter Suzanne Lloyd and I will be introducing Lloyd’s final silent comedy Speedy (1928) at the Castro Theater as part of the San Francisco Silent Film Festival’s 20th anniversary program. Live musical accompaniment will be provided by Rodney Sauer’s Mont Alto Motion Picture Orchestra. Here are five fun facts about the movie. 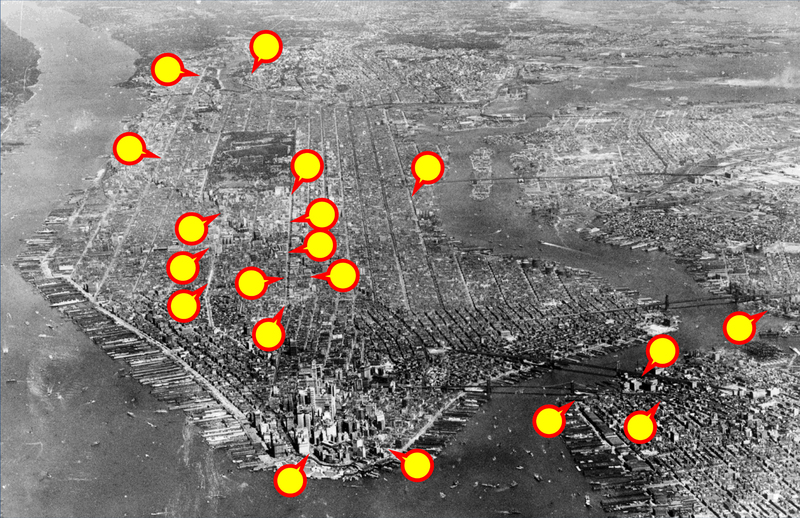 While most “New York” based films contain only a few stock footage establishing shots, Lloyd filmed ALL OVER – from Hamilton Heights north, to the tip of Bowling Green south, as well as in the Bronx, Brooklyn, and Coney Island. Lou Gehrig has a cameo DURING Babe Ruth’s cameo. You can read more about Gehrig’s appearance HERE. Throughout the film Speedy cuts back and forth between scenes shot in New York and Los Angeles. This view looks south down Witmer in Los Angeles towards the Mayfair Hotel. This hotel appears in the 1950 film noir Edge of Doom and in the television series The Office. (C) 2011 Google. Buster Keaton (far left) and Al St. John rode the same Witching Waves ride at Luna Park during their Roscoe Arbuckle short comedy Coney Island (1917) that Harold and Ann Christy rode ten years later filming Speedy. 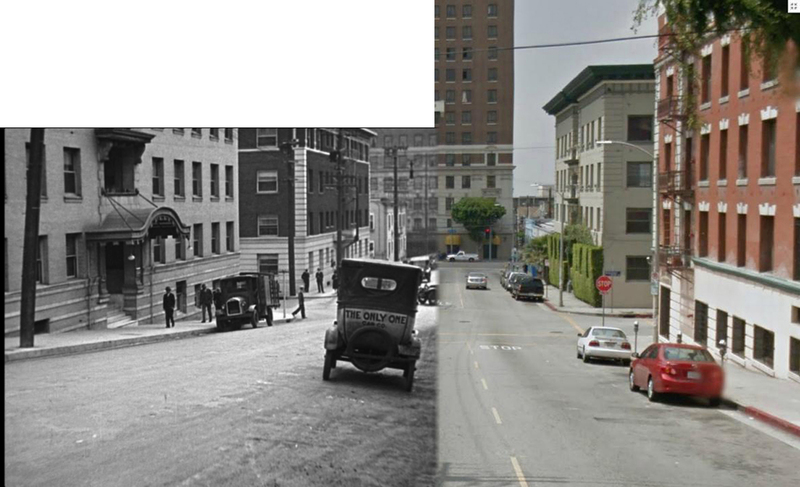 Lloyd built a huge New York backlot (box) near Westwood Village (at back). The lot stood not far from the Westwood Village Memorial Park (dark vegetation left of center), where many notables, including Marilyn Monroe, are buried. A middle school and a large Mormon temple were built on the backlot site. I’ve posted many other stories about Speedy (see the list HERE), and cover it thoroughly in my Harold Lloyd film locations book Silent Visions. Here’s also a link to an online article I prepared for the Museum of the Moving Image in New York when I spoke there in 2011. I’ll be available all this weekend to sign books at the festival. 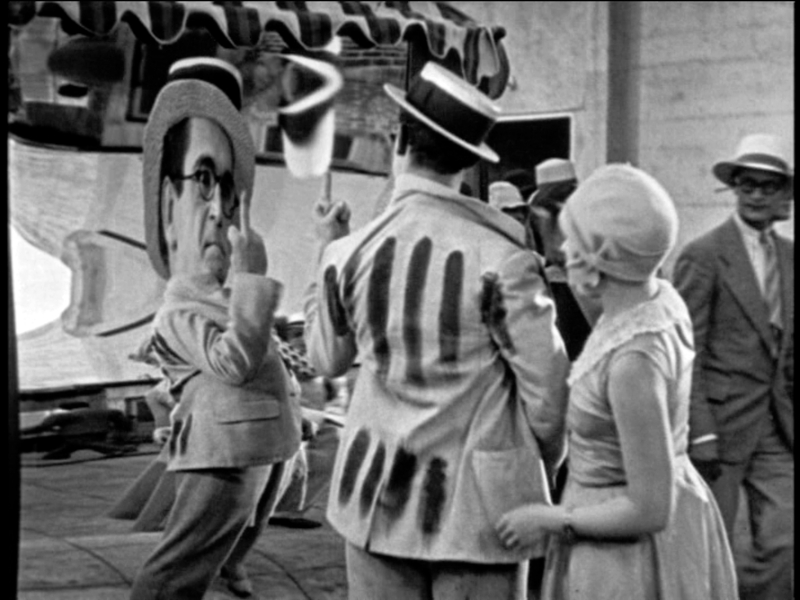 This entry was posted in Harold Lloyd, New York, Speedy and tagged Harold Lloyd, Manhattan, New York, Silent Comedians, Silent Comedies, Silent Movie Locations, Speedy, then and now. Bookmark the permalink. Great post as ever, John. You mention Lloyd’s lot is “adjacent” to the Westwood Village Memorial Park but this is not quite correct. If you look at the aerial you can see a wooded patch at the corner of Glendon and Wilshire (just south of the business district before the wider lanes of Glendon lead towards the taller buildings). The mortuary, still there and now surrounded by tall buildings, is about half a mile away. Thanks so much Roger – I misread my own notes! Since I live in LA, I love reading these posts as sometimes I actually can visit the areas you are finding and pointing out! Wow! I never knew or noticed Gehrig before! Great find!